There is, for example, an f.c.c. : face-centered cubic arrangement, known as “austenite”. In this case, the iron atoms sit on the corners of the crystal lattice cube with an atom in the center of each face of the cube. Then there is the b.c.c. : body-centered cubic layout. Again, the iron atoms are arranged on the corners, but with another one in the cube’s center. There is also a type in which the iron atoms are distributed in a hexagonal arrangement. The body-centered cubic and the hexagonal forms are both traditionally referred to as martensite. 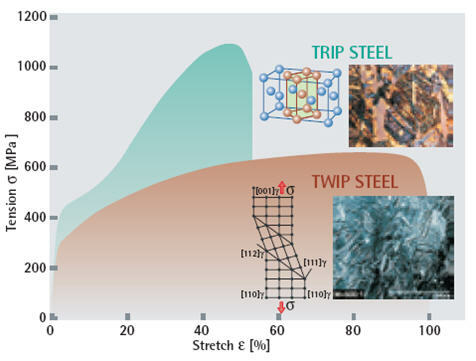 The crystal lattice changes, and with it, the character of the steel, depending on the alloy element content (the alien atoms in the crystal lattice). 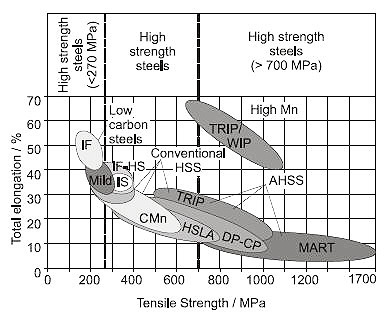 However, the double TRIP effect does not explain why an alloy with 15-25 manganese content is particularly ductile. This is caused by small faults in the crystal structure called “stacking faults”. Stacking faults can be visualized as a shift in the grid of atomic planes neatly arranged side by side and one on top of the other. If an extra stack of two atomic planes is introduced into the lattice from above, the regular stacking sequences are disturbed and therefore form a stacking fault. This folding mechanism takes place on a mirror plane, creating regularly mirrored sections of crystal. Experts refer to this as twinning, which is what manifests itself externally as extreme ductility. As discussed above, carbon improves the stability of austenite and strengthens the steels. It inhibits the formation of ε-martensite by increasing the stacking fault energy. Manganese stabilizes austenite. However if its content is less than 15%, α’-martensite is formed, which aggravates the formability. 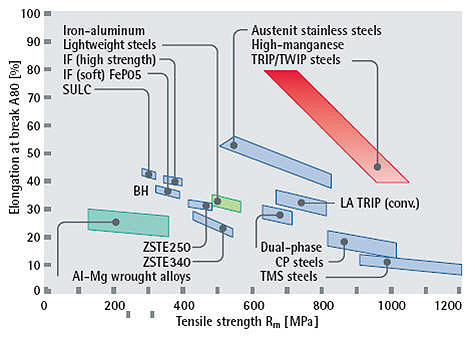 This entry was posted in Automotive, High Strength Steels, Mechanical properties. Bookmark the permalink.